CHAMAPIGN, Ill. (AP) — Coming to Illinois on Saturday, a long list of milestones were on the line for Michigan State. Best start in team history. A chance for Tom Izzo to move up the ladder of Big Ten coaching wins. And, oh yeah, the top spot in the conference standings to protect. The Spartans (17-1, 6-0 Big Ten) checked off all those boxes, holding off Illinois in a sometimes frustrating, physical contest, 78-62. Izzo, who moved past Illinois’ Lou Henson and into the No. 4 spot on the list of all-time Big Ten wins with 215, called the victory a sign of progress. "We’re getting there," he said. "We’re gutting things out. We’re better defensively than we were a month ago, we’re better rebounding than we were a month ago." No Spartans team before this one started with 17 wins in its first 18 games. The shot at that served as motivation, said Denzel Valentine, who had a game-high 11 rebounds and 15 points. "We kept saying, `Let’s make history,’" he said. While Michigan State won its 10th straight, Illinois (13-6, 2-4) has now lost four in a row. The frustration was apparent during several loud exchanges between coach John Groce and officials. The last one earned him a technical foul. But Groce said Michigan State was just better. "Today’s issue wasn’t fight; today’s issue was we ran into a really, really good basketball team," he said. Izzo said he talked with Henson, who was at the State Farm Center, before the game, but downplayed moving into the No. 4 spot. Bob Knight holds the No. 1 spot with 353. "It’s nice," Izzo said. "I’m going to call Bob and make sure he realizes there’s no worries. Nobody’s catching him." Michigan State owned the boards early against the Illini, outrebounding them 24-10 over the first 20 minutes. The Spartans used that edge to open up a 10-point lead by halftime and held the Illini at arm’s length the rest of the night. Gary Harris had a game-high 23 points and Keith Appling added 15 for the Spartans. Tracy Abrams led Illinois with 15 points. Illinois closed to within six at 59-53 with 6:11 in the game on a pair of free throws by Abrams. But almost as quick as those shots sparked a little hope for Illinois, Appling snuffed it out with a long 3-pointer from the top of the arc. 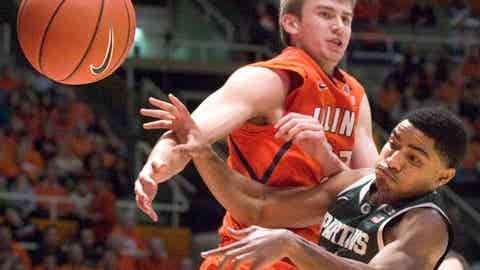 "For whatever reason, we fell down in the zone," Groce said. "Appling made a big shot." Michigan was up 62-53 with 5:43 to play, and with the Illini shooting a tepid 37.7 percent and unable to drum up many second chances, Michigan was comfortably out front. The Spartans played without 6-10 center Adreian Payne, out for a third consecutive game with an ankle injury. But against an Illinois team with little inside presence, they didn’t seem to need him. "We learned to play without him," Harris said. "Some other guys stepped up. We’re building a deeper team." Michigan State outrebounded Illinois 38-25. Valentine was at times dominant, particularly in the first half. He had nine rebounds by halftime and held Rice to 12 points. Rice entered as the conference’s second-leading scorer, averaging 17.7 points a game. The Spartans also made the most of their shots, sinking 55.8 percent of them. Illini big men Nnanna Egwu and Maverick Morgan had a combined five rebounds and four points. Egwu hasn’t scored in his past two games in spite of starting both and playing 55 minutes. Groce’s frustration has been growing with the losing streak. After Wednesday’s loss to Purdue he charged toward officials to complain about calls. Early in the first half Saturday night, he shouted across the court at his own team after a miss, "I didn’t want that!" He then turned and slammed his fist into the scorer’s table in front of the Illinois radio crew. Late in the game, after several confrontations with officials, he threw his suit jacket and was called for a technical foul. Groce declined to discuss his exchanges with officials or their calls, but both he and Izzo said they believe there are problems with how rule changes designed to increase scoring are being called. "In my opinion, it’s completely different than maybe what I saw on the (NCAA) video that was sent to me in the fall," Groce said. "I think everybody’s confused," Izzo added. "It’s hard on everybody." Illinois has a tough road ahead with its next four at No. 11 Ohio State, at Indiana and then at home against No. 14 Iowa and No. 3 Wisconsin. The Spartans play their next two at home, Tuesday against Indiana and Jan. 25 against Michigan.